Another option is a water garden with a wider theme – something in the style of a country, such as Japan, is the most popular. A Japanese influence can bring an exotic and often sub-tropical feel to the garden, although the preconceived image of a Japanese garden rarely equates with that of the traditional art form. With such diverse cultures it is difficult to appreciate all aspects of each other’s artistic creations, and a garden which adheres in every way to the influence of the Orient is unlikely to satisfy all the requirements of a modern western family. However, the Japanese ‘feel’ can be achieved by planting, by the use of oriental materials like bamboo, by recreating some of the fundamental principles of Japanese landscape design and, of course, by appropriate use of water. In any Japanese-style garden water is central to the scheme, whether it be in the form of an elegantly shaped extensive pool, or as a simple bamboo shishi-odoshi (deer scarer), periodically spilling water into a bowl. The shape of a ‘Japanese’ pool does not matter too much – as long as it is neither perfectly square nor round – for Japanese gardening is about creating a picture that brings the landscape of the countryside into the garden in a much reduced form. Islands can figure prominently, or mountainous representations, which are generally large rocks generously planted or closely associated with shrubby evergreens like the Japanese azalea or maple. The oriental garden also uses the shoreline creatively. 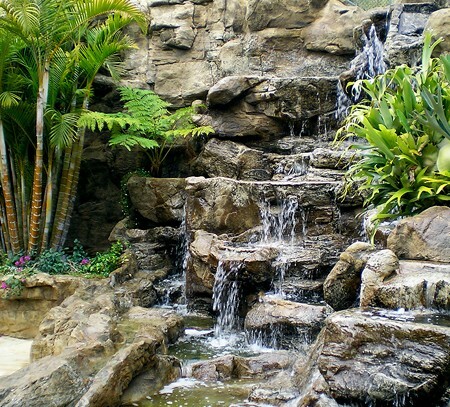 Rocks and planting create niches and promontories and, where water enters a pool from a stream, planting must conceal the entry. A low, flat island alludes to a moor, and is usually planted with grasses, sedges and irises, while tidal islands are represented by almost completely submerged rocks interspersed with a tiny grassy planting. complement and contrast with each other are also used just beneath water level along the pool edge. Of the greatest importance, however, is the choice and arrangement of plants: not all need be from the Orient, but they must look right. 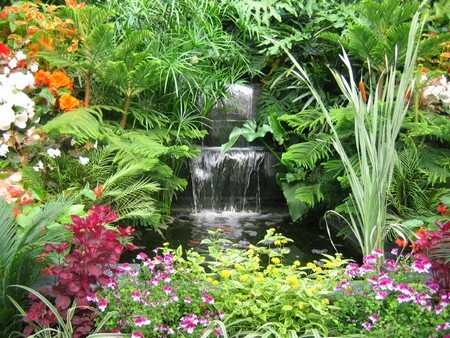 Choose bamboos, grasses, irises, primulas and ferns. Where water is the focal point it is fun, and wholly appropriate, to grow a lotus.